A head-on crash between a car and a van partially blocked the A605 near Peterborough this morning, Tuesday December 15. 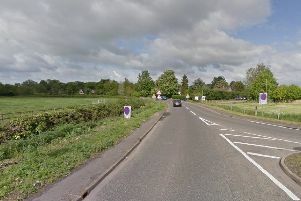 The collision, involving a blue Audi A4 and a White Volkswagen Caddy took place between Elton and the A1M/A1139 Fletton Parkway junction at 8.13am. The Audi left the road and crashed into the verge. Two ambulance crews, an ambulance officer and a response car from Magpas attended. They treated a woman in her 40s who had a suspected broken wrist and had abdominal and chest pain. She was taken to Peterborough City Hospital for further treatment. A man in his 20s was also taken to Peterborough City Hospital as a precautionary measure. There were delays on the A605 in both directions.